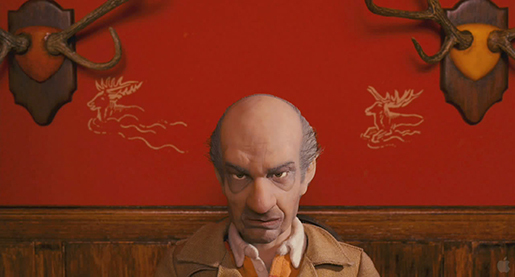 Anderson collaborates once again with writing partner Noah Baumbach after their most segregating work The Life Aquatic with Steve Zissou (2004) on adapting the Roald Dahl novel Fantastic Mr. Fox. Their screenplay is stuffed with delightful quirks such as “a quick karate lesson.” Anderson and Baumbach incorporate many idiosyncrasies independent of Dahl’s prose, but are perfect to the author’s original vision, nevertheless. Surely Dahl could have invented the droll and convoluted outdoor game Whackbat. As with all of Anderson’s films starting with Bottle Rocket (1996), his main characters are driven to break the law out of their naïve view of rebellion. They get a thrill out of playing adult, but must also face that being an adult is just a sad ordeal. Just because they’ve grown up doesn’t mean that they’re going to let their inner child down. As adults, they zealously follow their renegade dreams that are founded on that childhood peace made possible by Cops and Robbers. What a lark to commit a robbery! Had Max Fisher from Rushmore (1998) built that aquarium institution over the baseball field, he’d have enjoyed the rush of getting away with it. Leads like Fisher and Royal Tenenbaum would be so disappointed if they couldn’t play “the robber”. And that’s exactly what it is — play! All of Anderson’s characters are simply playing wicked. For instance, the would-be burglars in Bottle Rocket are truly innocent — a realization that Luke Wilson’s Anthony comes to when it’s too late. Anyone who would want to play “the cop” would not get a Wes Anderson film. Even the cunning Mr. Fox is an innocent. He intends no harm while indulging his greatest heist fantasies, except for the chickens. Seeing no need for further suffering, Mr. Fox makes a point of applying one fatal bite to the neck. Mr. Fox’s vulnerable son Ash deeply resents his more talented and elegant cousin, Kristofferson whose athleticism wows everyone including Mr. Fox. Though, like most Wes Anderson characters, Kristofferson (Eric Anderson) takes little joy from his talents and accomplishments. He is worried about his ailing father and correctly feels snubbed by Ash. My favourite scene between the two takes place over their bunk beds. Poor Kristofferson cries himself to sleep and Ash reluctantly finds a quiet way to cheer him up. 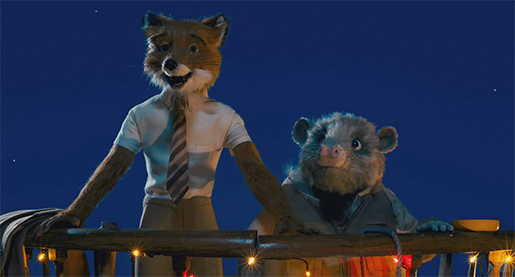 These two critters represent the filmmakers’ returning theme of brotherhood. The farmers Walter Boggis (Robin Hurlstone), Nathan Bunce (Hugo Guinness) and their malicious leader Franklin Bean (Michael Gambon) are all real grotesqueries. The casting of Gambon, who played the Thief in Peter Greenaway’s The Cook, The Thief, His Wife and Her Lover (1990) — one of cinema’s greatest villains, as Bean is truly inspired. He makes villainy sound so genteel and slithery. Bean then hatches a Master Plan of his own involving excavators, dynamite and an ominous title card “Chapter Six: The Shooting”. How much of a threat is Bean? Bean puts spite over his fashionable attire. Considering he’s in a Wes Anderson feature, that’s big time! Overshadowing the wrath of the farmers is the disintegration of the Fox family. Both writers have each dealt with the subject of divorce. For Anderson, it was The Royal Tenebaums (2001). For Baumbach, The Squid and the Whale (2005). The coldest realization of this is when Mrs. Fox, a resolute but not unkind realist, tells her husband, “I do love you, but I should never have married you.” For Mr. Fox, losing his beloved wife is worse than death. At one point, he glibly refers to his next course of action as a suicide mission. The way he says this plays slyly like both comedy and as a coping mechanism. Anderson and Baumbach have an underhanded way of holding a grave scenario from an humorous and ironic distance that instills total sincerity. 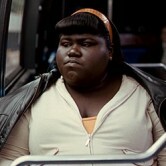 Anderson frankly establishes his characters with an explicit personality, talents and hobbies. The flavouring of these characters is richer, for example, the fact that Boggis eats four meals of chicken every day makes him more slimy. As an exceptional landscape painter, Mrs. Fox is compelled to incorporate natural disasters on her otherwise calming canvases. Her mindset is that of a hopeful cynic — wishing the best, expecting the worst. 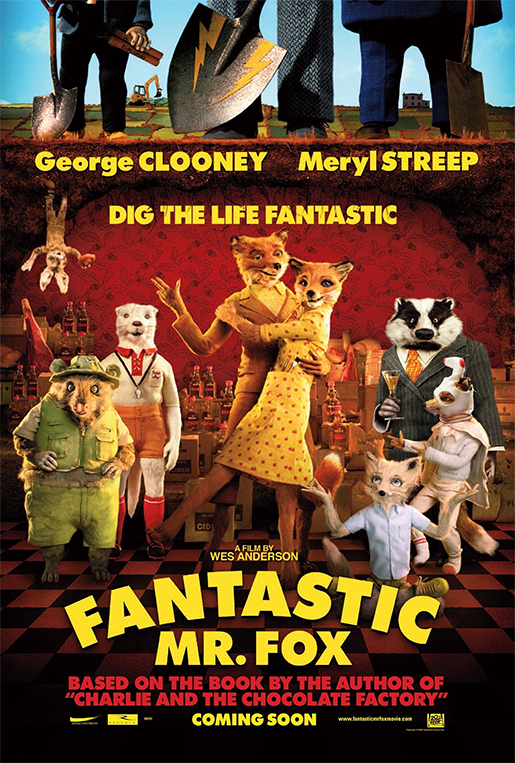 Bill Murray is very convincing as a Badger who works as an attorney and who has good reason to be angry with Mr. Fox. Owen Wilson deftly handles his one scene as Coach Skip, a badger who knows the rules of Whackbat by heart (the running joke is that everyone understands dense instructions instantaneously) and can say, “You’re improving” — meaning exactly that. Willem Dafoe plays The Rat, a lackey to Bean, who is not shy about his salacious feelings toward Mrs. Fox. All of the characters act low-key to a degree, but their attitude is a stark contrast to their life-and-death situation. Their deadpan dialogue is occasionally stamped with equally deadpan (Futura Bold) title overlays. Most animated shows feature animals who act exactly as humans would. They walk on two legs instead of four. They dress, talk and live just like people do. All of the “animal” of the animals have been sucked right out except for physical appearance. 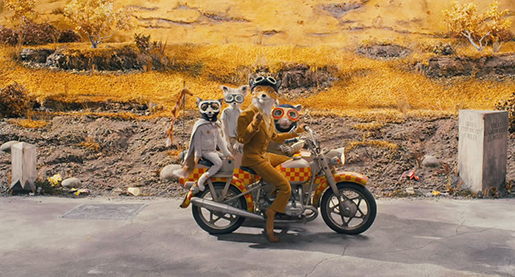 Fantastic Mr. Fox deviates from this trend; allowing its mammals to struggle with their human and animal characteristics. The creatures lose their composure under either great duress or bouts of ravenousness and let loose, growling. Then again, people lose themselves under those circumstances as well. From human nature to just plain nature, there is a delicate poignancy to these “wild animals” who go to such extreme lengths to be civilized. However, Fantastic Mr. Fox is just a few beats short of approaching the heartbreaking and needful dignity of the well-suited chimpanzee Cornelius from George Miller’s masterpiece Babe: Pig in the City (1998). 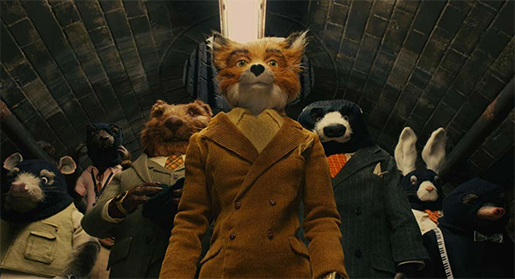 Along with this year’s stellar animated entertainments Coraline and Where the Wild Things Are, Fantastic Mr. Fox is by far an acquired taste. I consider these movies to be substantial magic. I like it so much more because I feel that the film and I are sharing a conspiracy. If it appealed to everyone, it wouldn’t feel so personal. As entertainment for children, these polarizing films will do much more to shape them into more interesting people. Because a film is more intense and adult, it can provide a stimulating work of imagination and intelligence for the young. You don’t think I got this way watching only movies that cater to that loose and restrictive idea known as “appropriate for children,” do you? Kids enjoy a little danger. A fox that talks about a double standard in regard to his wife’s past is still a talking fox. 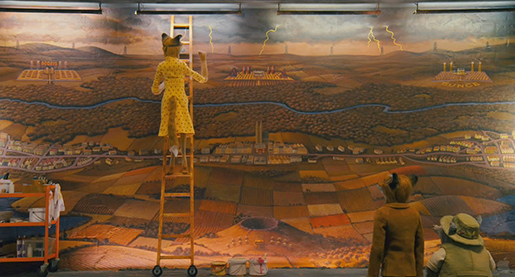 Along with Spike Jonze, Wes Anderson is one of the few filmmakers who get the way a child thinks. In The Royal Tenenbaums, where do Margot and Richie as kids run away to? The Museum of Natural History, of course! Composer Alexandre Desplat (The Queen (2006) and my personal favourite Girl with a Pearl Earring (2003)) reinvents himself by embracing the Country genre with Spaghetti Western influences in a fresh, threatening and kooky manner. However, Desplat never condescends to the material and commands his score like it were an epic. He enlivens it with nervy touches such as prominent flutes, stringy plunks and twangs, and marching band drumming that all feel at home with a vintage Danny Elfman album. Occasional chimes and heavy drumbeats to signify dread also reminds me of Carter Burwell’s signature. The use of Beach Boys songs Heroes and Villains and I Get Around also complement the bizarre soundtrack. This is the same Wes Anderson who played “You Are Forgiven” from The Who’s 9-minute A Quick One While He’s Away over Max and Mr. Blumes’ “This Means War” montage. The best in-joke is the use of the Nancy Adams song Love, which was written for Disney’s Robin Hood (1973) — another animated film starring a fox. 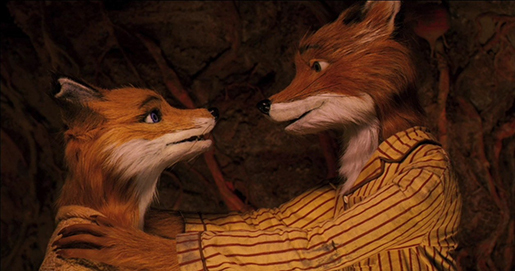 Only Mr. and Mrs. Fox don’t inspire a gag reflex like the following sacrosanct scene by Disney. I don’t care if Robin Hood gave all his money to the poor, he’s still a cheap date. The overall animation is a springy mixture of rawness and delight. There is something a little unkempt and rustic about the textures here. Imagine if Nick Park (Chicken Run, 2000) and Jan Svankmajer (Alice, 1988: a 5-minute oddity stretched out to 86-minute endurance test) were forced to work together. These animals are not cuddly in a generic sense, though they possess a matured cuteness. Their fur looks both prickly and soft. To touch them, you’d have to be very careful and delicate with them. The fox’s figures are finer than one would imagine: more tall and slender. The naturalness of the animals also makes them more charming and sympathetic than a caricature would. When little Kristofferson is held upside down by his leg, he looks so pitiful and defenseless. Appropriately enough, it is the chilly humans that look grossly unapproachable. Having worked on Will Vinton films, the animation director Mark Gustafson has brought a great deal of that sickly, albeit fascinating influence into this film. Other liberties are taken to show bizarre and alternate take of characters’ most subconscious attitudes like the frightened face shown at full front and a literal glow on a character experiencing bliss. Everything is so splendidly artificial. 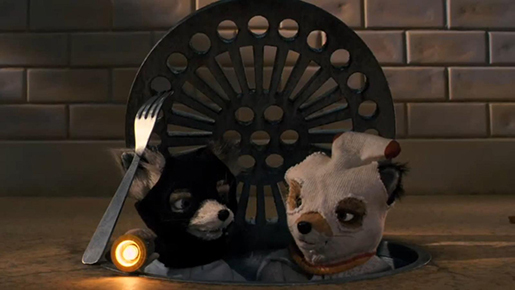 Some professional visual effects artists go to pains to be invisible; Fantastic Mr. Fox openly relishes the joy of being effects. The painted backdrops for the skies look just like painted backdrops because the illusion is only half the fun. Why go to the Uncanny Valley if you can look at an actual sky outside? The coveted apple cider in Bean’s basement is justly described as liquid gold. Just as clever are the small details like the Badger skull T-shirt worn by one of the toddlers. It was only a matter of time before Anderson crossed over to animation. Animators have the luxury of transforming the space within the frame with the unrealistic specifics of a perfectionist. Thanks to cinematographer Tristan Oliver and production designer Nelson Lowry whose colour scheme is very Autumn, Anderson continues to make every composition adhere to an exacting and geometrical design founded on a grid. While watching the film, I felt the compulsion to start drawing up vertical and horizontal lines measured acutely across the screen. Somehow, the compositions are so painstaking that they look rather peculiar. These aesthetics were fully formed in Rushmore and carried out from there. Within the landscape, a thin strip of space is usually reserved for a small train that passes by from a great distance. In a perfect world, wouldn’t all of our last names illuminate our properties so harmoniously? Since most of the action is framed from a distance worthy of a Buster Keaton feature — Keaton: “Tragedy is a close-up; comedy is a long shot.” — the filmmakers gleefully jar us with extreme close-ups of wide, frightened eyeballs and gnashing teeth. Wes Anderson is one of the most romantic of filmmakers we have today. 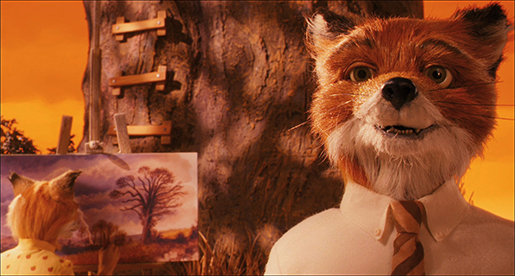 Mr. Fox is a model to those who respect an extravagant and genteel pride in oneself. It is for whoever swoons over wishing their wife well with the blow of a kiss followed by complimenting dinner last night as “exquisite”. You know who you are. How telling it is that the Tenenbaum Family Plot should be considered a character of equal value with the rest of the characters illustrated in their own chapters. Given the limited hours out of a day, it would be impossible for Max Fischer, despite failing his classes, to attend so many after school activities, clubs, and direct his extravagant plays. In Wes Anderson’s universe, Fischer can be as busy as he pleases. For those who enjoy Anderson’s brevity and eccentricity, I say put on your favourite bandit hat and have fun staging a coup on the chicken coop. 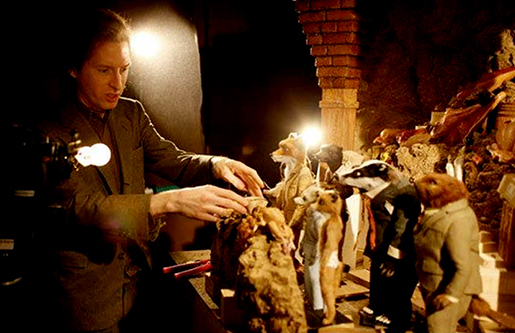 Wes Anderson accepts National Board of Review (NBR) Award in stop-motion animation. I’ve always wondered what Wes Anderson’s power animal is and now I know.